Many economists have been expecting the housing boom to provide a visible lift to the US economy. So far the results have been underwhelming. 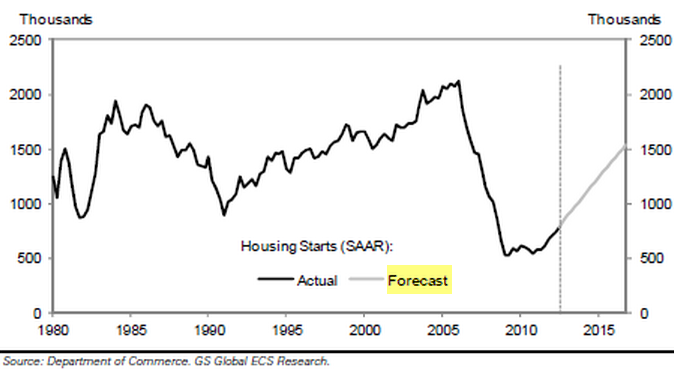 In spite of strong homebuilder optimism (see post), housing starts remain subdued. The momentum we saw in late 2012 has dissipated and last year's forecasts (for example Goldman and ISI Group) turned out to be too optimistic. The direct impact on jobs has been almost nonexistent, as the number of residential construction jobs has barely budged (still below the level it was in January of 2010). There is another trend that is probably not helping with conversion of new home activity into the economic growth some were expecting. 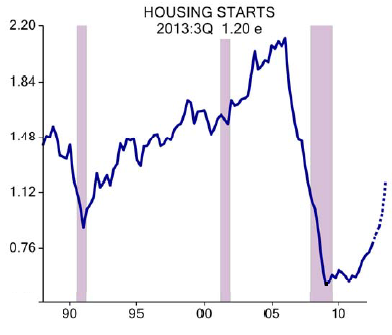 Multi-family units represent an increasing proportion of total housing starts. It is possible that because these units are more likely to be rentals, the "multiplier effect" of housing just isn't as strong. Homeowners (living in a single-family unit) will probably spend considerably more in house-related purchases than multi-family unit renters (or even condo owners). This combination of factors has so far resulted in a disappointing impact of the housing recovery on the US economy. Some economists are saying that the best is yet to come. Perhaps.